I wish I had spotted this earlier. They have five top strategies for social issue filmmakers. And they have five case studies to read. Here's the one on TFF Hero Tiffany Shlain. What are you waiting for? This is Required Reading. 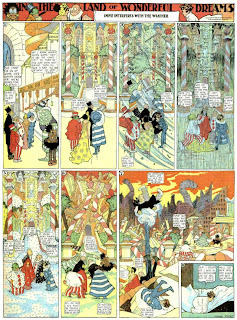 Over at Bowl Of Noses, I've posted about one of my true heroes, someone whose imagination has driven mine, whose art has inspired me and driven me, whose life I wonder about: the man who gave us the comic strip, moving pictures, and true hybrid works, Windsor McCay. Little Nemo In Slumberland and Dreams Of A Rarebit Fiend are must haves, true Essential Reading. I just had the pleasure of stumbling across a study he did, a work in progress. CENTAURS are the early stages for a film we will never get to see. But we do get to see his strong line drawing and the personality he injected into each character while delving into art in the age of mechanical reproduction. The joy the young centaur -- they would truly be "kids", right? -- projects at the end of the piece speaks to what could have been. The curse that the only Little Nemo we have to enjoy as a completed animated film is the one we have is a true misfortune. Also be sure to check out Meeting McCay, hailing from Windsor's home town in Michigan, Spring Lake, and chock full of good stuff on the man, his art, and his influence. I recommend you buy the books, but you can enjoy an excellent taste of Nemo over at the Comic Strip Library. Peter Broderick, who has been preaching the DIY Distro gospel longer than anyone I know (and thus is also on TIFH chart), has written a great two part article on the benefits of living in the real world aka the new world for IndieWire. It's REQUIRED READING.